Definition at line 31 of file itkRBFBackPropagationLearningFunction.h. 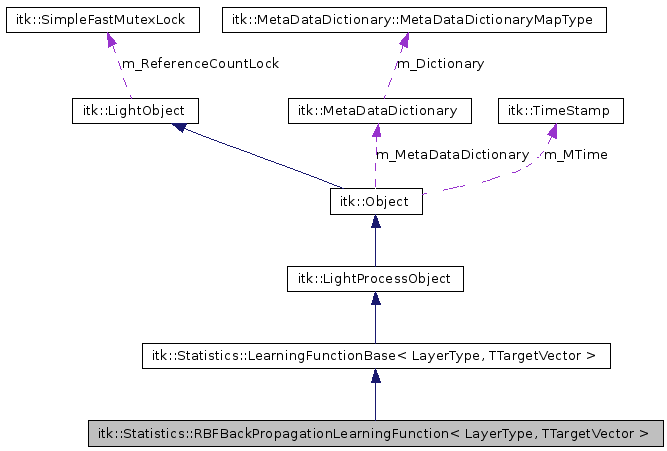 Reimplemented from itk::Statistics::LearningFunctionBase< LayerType, TTargetVector >. Definition at line 38 of file itkRBFBackPropagationLearningFunction.h. Definition at line 139 of file itkLightObject.h. Definition at line 40 of file itkRBFBackPropagationLearningFunction.h. Definition at line 37 of file itkRBFBackPropagationLearningFunction.h. Definition at line 35 of file itkRBFBackPropagationLearningFunction.h. Definition at line 36 of file itkRBFBackPropagationLearningFunction.h. 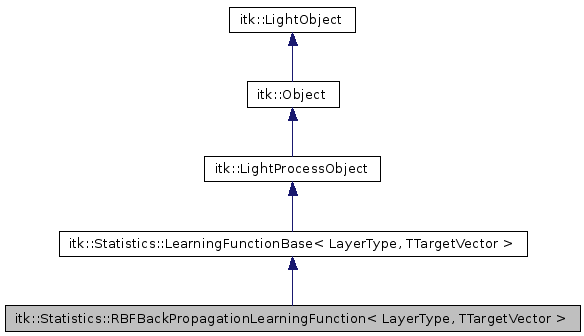 Definition at line 45 of file itkRBFBackPropagationLearningFunction.h. Definition at line 62 of file itkRBFBackPropagationLearningFunction.h. Turn on and off the AbortGenerateData flag. This method is called when itkExceptionMacro executes. It allows the debugger to break on error. Delete an itk object. This method should always be used to delete an object when the new operator was used to create it. Using the C delete method will not work with reference counting. This method causes the filter to generate its output. Reimplemented in itk::ClassifierBase< TDataContainer >, itk::ImageClassifierBase< TInputImage, TClassifiedImage >, itk::ImageGaussianModelEstimator< TInputImage, TMembershipFunction, TTrainingImage >, itk::ImageKmeansModelEstimator< TInputImage, TMembershipFunction >, itk::ImageModelEstimatorBase< TInputImage, TMembershipFunction >, itk::LevelSetNeighborhoodExtractor< TLevelSet >, itk::Statistics::SampleClassifier< TSample >, itk::Statistics::SampleClassifierWithMask< TSample, TMaskSample >, itk::ClassifierBase< TInputImage >, and itk::ClassifierBase< TSample >. Definition at line 123 of file itkLightProcessObject.h. Get the AbortGenerateData flag for the process object. Process objects may handle premature termination of execution in different ways. Get the command associated with the given tag. NOTE: This returns a pointer to a Command, but it is safe to asign this to a Command::Pointer. Since Command inherits from LightObject, at this point in the code, only a pointer or a reference to the Command can be used. Get the value of the debug flag. A constant reference to this objects MetaDataDictionary. A reference to this objects MetaDataDictionary. This reference may be changed. Return this objects modified time. Reimplemented in itk::ImageRegistrationMethod< TFixedImage, TMovingImage >, itk::ImageToSpatialObjectRegistrationMethod< TFixedImage, TMovingSpatialObject >, itk::MultiResolutionImageRegistrationMethod< TFixedImage, TMovingImage >, itk::PointSetToImageRegistrationMethod< TFixedPointSet, TMovingImage >, itk::PointSetToPointSetRegistrationMethod< TFixedPointSet, TMovingPointSet >, itk::DeformationFieldSource< TOutputImage >, itk::InverseDeformationFieldImageFilter< TInputImage, TOutputImage >, itk::ResampleImageFilter< TInputImage, TOutputImage, TInterpolatorPrecisionType >, itk::VectorResampleImageFilter< TInputImage, TOutputImage, TInterpolatorPrecisionType >, itk::BoundingBox< TPointIdentifier, VPointDimension, TCoordRep, TPointsContainer >, itk::ImageAdaptor< TImage, TAccessor >, itk::ResampleImageFilter< TInputImage, TOutputImage, TInterpolatorPrecisionType >, itk::TransformToDeformationFieldSource< TOutputImage, TTransformPrecisionType >, itk::ImageSpatialObject< TDimension, TPixelType >, itk::MeshSpatialObject< TMesh >, itk::SceneSpatialObject< TSpaceDimension >, itk::SpatialObject< TDimension >, itk::ImageAdaptor< TImage, itk::Accessor::AsinPixelAccessor< TImage::PixelType, TOutputPixelType > >, itk::ImageAdaptor< TImage, itk::Accessor::AbsPixelAccessor< TImage::PixelType, TOutputPixelType > >, itk::ImageAdaptor< TImage, itk::Accessor::LogPixelAccessor< TImage::PixelType, TOutputPixelType > >, itk::ImageAdaptor< TImage, itk::Accessor::ComplexToPhasePixelAccessor< TImage::PixelType, TOutputPixelType > >, itk::ImageAdaptor< TImage, itk::Accessor::Log10PixelAccessor< TImage::PixelType, TOutputPixelType > >, itk::ImageAdaptor< TImage, itk::Accessor::ExpPixelAccessor< TImage::PixelType, TOutputPixelType > >, itk::ImageAdaptor< TImage, itk::Accessor::AddPixelAccessor< TImage::PixelType > >, itk::ImageAdaptor< itk::VectorImage< TPixelType, Dimension >, itk::Accessor::VectorImageToImagePixelAccessor< TPixelType > >, itk::ImageAdaptor< TImage, itk::Accessor::RGBToVectorPixelAccessor< TImage::PixelType::ComponentType > >, itk::ImageAdaptor< TImage, itk::PixelAccessor< TInternalType, TExternalType > >, itk::ImageAdaptor< TImage, itk::Accessor::SqrtPixelAccessor< TImage::PixelType, TOutputPixelType > >, itk::ImageAdaptor< TImage, itk::Accessor::AcosPixelAccessor< TImage::PixelType, TOutputPixelType > >, itk::ImageAdaptor< TImage, itk::Accessor::ComplexToModulusPixelAccessor< TImage::PixelType, TOutputPixelType > >, itk::ImageAdaptor< TImage, itk::Accessor::ExpNegativePixelAccessor< TImage::PixelType, TOutputPixelType > >, itk::ImageAdaptor< TImage, itk::Accessor::VectorToRGBPixelAccessor< TImage::PixelType::ValueType > >, itk::ImageAdaptor< TImage, itk::Accessor::TanPixelAccessor< TImage::PixelType, TOutputPixelType > >, itk::ImageAdaptor< TImage, itk::Accessor::ComplexToRealPixelAccessor< TImage::PixelType, TOutputPixelType > >, itk::ImageAdaptor< TImage, itk::Accessor::RGBToLuminancePixelAccessor< TImage::PixelType, TOutputPixelType > >, itk::ImageAdaptor< TImage, itk::Accessor::AtanPixelAccessor< TImage::PixelType, TOutputPixelType > >, itk::ImageAdaptor< TImage, itk::Accessor::SinPixelAccessor< TImage::PixelType, TOutputPixelType > >, itk::ImageAdaptor< TImage, itk::Accessor::ComplexToImaginaryPixelAccessor< TImage::PixelType, TOutputPixelType > >, itk::ImageAdaptor< TImage, itk::Accessor::CosPixelAccessor< TImage::PixelType, TOutputPixelType > >, itk::ImageSpatialObject< TDimension, unsigned char >, itk::SpatialObject< 3 >, and itk::SpatialObject< ::itk::GetMeshDimension< TMesh >::PointDimension >. Referenced by itk::SpatialObject< ::itk::GetMeshDimension< TMesh >::PointDimension >::GetObjectMTime(). Get the execution progress of a process object. The progress is a floating number between (0,1), 0 meaning no progress; 1 meaning the filter has completed execution. Gets the reference count on this object. Definition at line 106 of file itkLightObject.h. Definition at line 100 of file itkObject.h. Definition at line 98 of file itkObject.h. Return true if an observer is registered for this event. Call Execute on all the Commands observing this event id. The actions triggered by this call doesn't modify this object. Call Execute on all the Commands observing this event id. Update the modification time for this object. Many filters rely on the modification time to determine if they need to recompute their data. Reimplemented in itk::NormalizeImageFilter< TInputImage, TOutputImage >, itk::ImageAdaptor< TImage, TAccessor >, itk::MiniPipelineSeparableImageFilter< TInputImage, TOutputImage, TFilter >, itk::GrayscaleDilateImageFilter< TInputImage, TOutputImage, TKernel >, itk::GrayscaleErodeImageFilter< TInputImage, TOutputImage, TKernel >, itk::GrayscaleMorphologicalClosingImageFilter< TInputImage, TOutputImage, TKernel >, itk::GrayscaleMorphologicalOpeningImageFilter< TInputImage, TOutputImage, TKernel >, itk::MorphologicalGradientImageFilter< TInputImage, TOutputImage, TKernel >, itk::ImageAdaptor< TImage, itk::Accessor::AsinPixelAccessor< TImage::PixelType, TOutputPixelType > >, itk::ImageAdaptor< TImage, itk::Accessor::AbsPixelAccessor< TImage::PixelType, TOutputPixelType > >, itk::ImageAdaptor< TImage, itk::Accessor::LogPixelAccessor< TImage::PixelType, TOutputPixelType > >, itk::ImageAdaptor< TImage, itk::Accessor::ComplexToPhasePixelAccessor< TImage::PixelType, TOutputPixelType > >, itk::ImageAdaptor< TImage, itk::Accessor::Log10PixelAccessor< TImage::PixelType, TOutputPixelType > >, itk::ImageAdaptor< TImage, itk::Accessor::ExpPixelAccessor< TImage::PixelType, TOutputPixelType > >, itk::ImageAdaptor< TImage, itk::Accessor::AddPixelAccessor< TImage::PixelType > >, itk::ImageAdaptor< itk::VectorImage< TPixelType, Dimension >, itk::Accessor::VectorImageToImagePixelAccessor< TPixelType > >, itk::ImageAdaptor< TImage, itk::Accessor::RGBToVectorPixelAccessor< TImage::PixelType::ComponentType > >, itk::ImageAdaptor< TImage, itk::PixelAccessor< TInternalType, TExternalType > >, itk::ImageAdaptor< TImage, itk::Accessor::SqrtPixelAccessor< TImage::PixelType, TOutputPixelType > >, itk::ImageAdaptor< TImage, itk::Accessor::AcosPixelAccessor< TImage::PixelType, TOutputPixelType > >, itk::ImageAdaptor< TImage, itk::Accessor::ComplexToModulusPixelAccessor< TImage::PixelType, TOutputPixelType > >, itk::ImageAdaptor< TImage, itk::Accessor::ExpNegativePixelAccessor< TImage::PixelType, TOutputPixelType > >, itk::ImageAdaptor< TImage, itk::Accessor::VectorToRGBPixelAccessor< TImage::PixelType::ValueType > >, itk::ImageAdaptor< TImage, itk::Accessor::TanPixelAccessor< TImage::PixelType, TOutputPixelType > >, itk::ImageAdaptor< TImage, itk::Accessor::ComplexToRealPixelAccessor< TImage::PixelType, TOutputPixelType > >, itk::ImageAdaptor< TImage, itk::Accessor::RGBToLuminancePixelAccessor< TImage::PixelType, TOutputPixelType > >, itk::ImageAdaptor< TImage, itk::Accessor::AtanPixelAccessor< TImage::PixelType, TOutputPixelType > >, itk::ImageAdaptor< TImage, itk::Accessor::SinPixelAccessor< TImage::PixelType, TOutputPixelType > >, itk::ImageAdaptor< TImage, itk::Accessor::ComplexToImaginaryPixelAccessor< TImage::PixelType, TOutputPixelType > >, itk::ImageAdaptor< TImage, itk::Accessor::CosPixelAccessor< TImage::PixelType, TOutputPixelType > >, and itk::MiniPipelineSeparableImageFilter< TInputImage, TOutputImage, itk::RankImageFilter< TInputImage, TInputImage, itk::FlatStructuringElement< ::itk::GetImageDimension< TInputImage >::ImageDimension > > >. Referenced by itk::NarrowBandImageFilterBase< TInputImage, itk::Image< TOutputPixelType,::itk::GetImageDimension< TInputImage >::ImageDimension > >::InsertNarrowBandNode(), itk::MatrixOffsetTransformBase< TScalarType, 3, 3 >::SetCenter(), itk::HistogramAlgorithmBase< TInputHistogram >::SetInputHistogram(), itk::MatrixOffsetTransformBase< TScalarType, 3, 3 >::SetMatrix(), itk::NarrowBandImageFilterBase< TInputImage, itk::Image< TOutputPixelType,::itk::GetImageDimension< TInputImage >::ImageDimension > >::SetNarrowBand(), itk::NarrowBandImageFilterBase< TInputImage, itk::Image< TOutputPixelType,::itk::GetImageDimension< TInputImage >::ImageDimension > >::SetNarrowBandInnerRadius(), itk::NarrowBandImageFilterBase< TInputImage, itk::Image< TOutputPixelType,::itk::GetImageDimension< TInputImage >::ImageDimension > >::SetNarrowBandTotalRadius(), itk::MatrixOffsetTransformBase< TScalarType, 3, 3 >::SetOffset(), itk::ThresholdLabelerImageFilter< TInputImage, TOutputImage >::SetRealThresholds(), itk::CollidingFrontsImageFilter< TInputImage, TOutputImage >::SetSeedPoints1(), itk::CollidingFrontsImageFilter< TInputImage, TOutputImage >::SetSeedPoints2(), itk::NonUniformBSpline< TDimension >::SetSplineOrder(), itk::ThresholdLabelerImageFilter< TInputImage, TOutputImage >::SetThresholds(), itk::Statistics::GoodnessOfFitFunctionBase< TInputHistogram >::SetTotalObservedScale(), and itk::MatrixOffsetTransformBase< TScalarType, 3, 3 >::SetTranslation(). Cause the object to print itself out. Referenced by itk::WeakPointer< itk::ProcessObject >::Print(). Method to print the object. Increase the reference count (mark as used by another object). Remove the observer with this tag value. Set the AbortGenerateData flag for the process object. Process objects may handle premature termination of execution in different ways. Set the value of the debug flag. A non-zero value turns debugging on. This is a global flag that controls whether any debug, warning or error messages are displayed. Referenced by itk::Object::GlobalWarningDisplayOff(), and itk::Object::GlobalWarningDisplayOn(). Set the execution progress of a process object. The progress is a floating number between (0,1), 0 meaning no progress; 1 meaning the filter has completed execution. Decrease the reference count (release by another object). Update the progress of the process object. If a ProgressMethod exists, executes it. Then set the Progress ivar to amount. The parameter amount should range between (0,1). Number of uses of this object by other objects. Definition at line 144 of file itkLightObject.h. Definition at line 147 of file itkLightObject.h.